After World War One an area in Carinthia’s south east, where the majority of the population spoke Slovene, was claimed by the SHS state (the “Kingdom of Serbs, Croats and Slovenes”). On October 10, 1920 a plebiscite decided upon the national future of these parts: just under 60% of the population living there voted against secession and for union with Austria. On the occasion of the K08 exhibition we the course of the border as it was then planned examine on the basis of the map of the plebiscite. 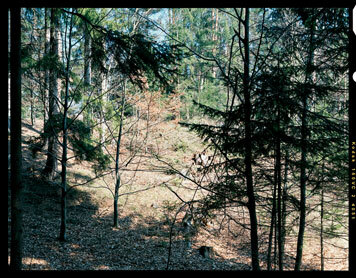 Visiting and walking the length of that frontier line is being documented photographically. By analogy to cartographic methods we put a certain screen across the map, thus defining place, viewpoint and line of sight of the photos. 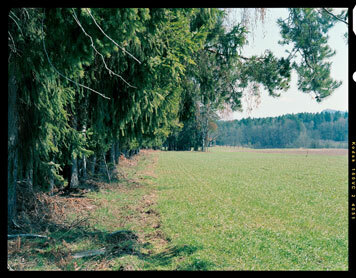 The internal Border, 2008 was produced in conjunction with the exhibition “K08: Emancipation and Confrontation — Art from Carinthia from 1945 to the Present”. Nach dem Ersten Weltkrieg waren die mehrheitlich von Slowenen bewohnten Gebiete im Südosten Kärntens durch den SHS-Staat (Königreich der Serben, Kroaten und Slowenen) beansprucht worden. Am 10. Oktober 1920 wurde per Volksabstimmung über die staatliche Zugehörigkeit dieser Gebiete entschieden: Knapp 60% der dort lebenden Bevölkerung stimmte für einen Verbleib bei Österreich. Anlässlich der Ausstellung K08 untersuchen wir anhand der Abstimmungskarte den damals erwogenen Grenzverlauf. Das Aufsuchen und Begehen der Grenze wird von uns fotografisch dokumentiert. Ort und Blickrichtung der jeweiligen Fotoaufnahmen wurden – in Anlehnung an kartografische Methoden ­– allein durch ein bestimmtes Raster, das wir über die Karte legten, definiert. 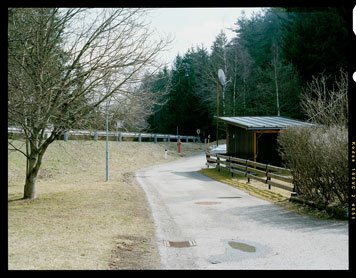 Die Innere Grenze, 2008 wurde anlässlich der Ausstellung „K08: Emanzipation und Konfrontation – Kunst aus Kärnten von 1945 bis heute“ produziert. The competition advertised for redesigning the film studios at the campus of the University of Music and Pictorial Arts called for questioning and redefining the studios’ location within the campus and its position in the city. The exteriors of the film studio (Uni Campus) is temporarily filled with people, like in movies’ crowd scenes. For such an operation the actual presence of people is needed (i. e. the corresponding translation): The idea is to have 5,000 people come to the campus during a set time of two hours. The realization of this idea corresponds with organising a film production. Yet, this set ends with the moment of “Film ab!” (Camera is rolling). (It is of importance to the concept that the set is exclusively experienced here and now. The potential “Camera is rolling”—“Film ab!”— is not carried out). There exists no documentation of this project. No documentary evidence remains, be it a construction, a film or photographs. 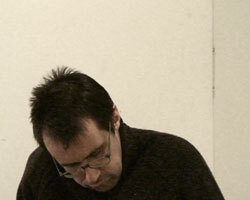 The project materializes through personal account and imagination. Der Wettbewerb zur Gestaltung der Filmstudios an der Universität für Musik und darstellende Kunst gibt Anlass das Studiogebäude innerhalb des Campus zu thematisieren, und seine Lage in der Stadt neu zu definieren. Das Projekt wird nicht dokumentiert. Es bleiben keine baulichen, filmischen oder fotografischen Dokumente. Das Projekt manifestiert sich durch Erzählung und Imagination. Extras is the name commonly given to those people who augment a scene without themselves actively appearing. Those who contribute to the liveliness and realism of a picture without stealing the show from the leading actors. 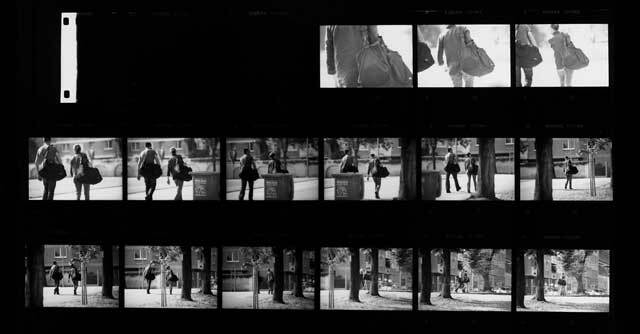 Extras are indispensable for framing action as a kind of moving background to the extent that they lend solidity and cohesion, in fact a kind of statics. For the foreground action they should not be more than living wallpaper but for the unity of a picture they represent almost something like a supporting foundation. Thus the placing of extras in a scene does in fact seem to have something to do with applied statics. The name “extras” is significant. Those special additions which contribute to improving fittings and comfort. but also to optimising the basic functioning of an act, a scene or a setting through the specific added value that they bring with them. Extras could also be seen as special picture surplus — those supporting components which are not in themselves necessarily seen but without which a noticeable emptiness and fragility would prevail. 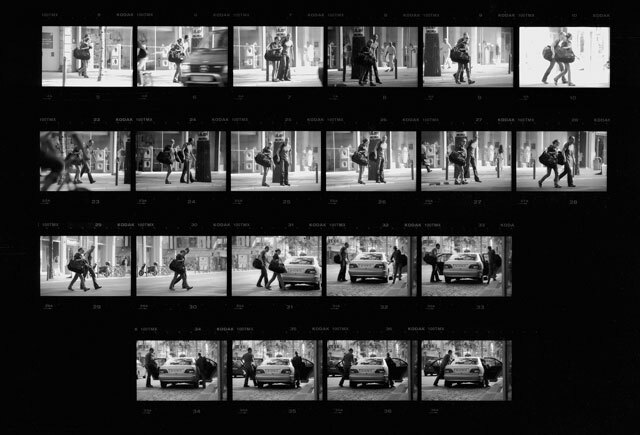 Only when one specifically addresses the role of extras does one get on the track of the functional connection of a picture, the interplay of figures and background, of plot and its location and of dynamics and immobility. Only focus on the many inconspicuous extras enables the opening up of the fine motor activity of a pictorial ensemble. Film ab!<font color="#FFFFFF">.</font> by Nicole Six and Paul Petritsch starts out from exactly such apparently minor matters. Minor matters and digressions which shift to the centre of events and effectively undermine the common connection of meaning between an architectonic setting and its primary action components, from its artistic environment to the actors to be encountered there each day. The shift which Six and Petritsch make with their Kunst–am–Bau<font color="#FFFFFF">.</font> (Art on the Construction Site) project on the campus of the University of Music and the Performing Arts, Vienna, includes several levels: location-specific<font color="#FFFFFF">.</font> — related to the production site of the film studio, pictorially grammatical — with the targeted generation of a mass scene, and not least artistic–architectonic<font color="#FFFFFF">.</font> — instead of a permanent design intervention an ephemeral event takes place. On all these levels they divert attention towards special surpluses, to extras in the sense described above, who would not straightaway be expected in a Kunst–am–Bau<font color="#FFFFFF">.</font> connection, but who instead show all the more clearly where its most neuralgic and sometimes trouble-prone places are. film studio building on the campus of the University of Music and the Performing Arts. How tempting it must have been to fill the plain, mostly window-less outside walls with all kinds of reference materials from film and media contexts. With reminiscences of cinema history, samples of subjects negotiated at this spot or perhaps even as an advertising space for the student works produced inside. None of all this. As qualified architects Six and Petritsch do not intervene in the grid–like design and geometrical balance of the facade. Instead they see the surrounding space of the building, a newly acquired place, as their primary play area — a forum of a special kind which calculatingly only permits itself to be used by a certain number of people. Film does not necessarily mean a star cast, but sometimes also anony- mous mass production, and where, apart from this central outdoors space decorated with the new construction, can such a thing be realised? By taking up a method of film staging, Six and Petritsch do not only show the functional context of the building but shift it in the direction of a special form of staging, mostly reserved for very expensive (or very cheap) productions. Film and masses, the latter usually only experienced at the reception end of the medium of film, are brought together in one of their original overlapping moments. As already suggested, a basic shift is at work in this combination. In the context of film the masses, or the extras embodying them, usually function as the background to a storyline — as an anonymous, undifferen-tiated foil, from which the protagonists stand out in their individuality. In contrast there is a line of film history, coming from early cinema via Benjamin and Krakauer to the Soviet revolutionary film in which the masses can themselves become an actor. Not as part of the setting or social basis of a scene but as a collective subject, which sees itself as an entity of the plot — as impressively demonstrated in Eisenstein‘s Battleship Potemkin and October.<font color="#FFFFFF">.</font> To stage a mass as a mass and not as the background for a special scene enters this cinema historical tradition — incidentally a tradition which appears to be more and more forgotten with the prevalence of the Hollywood film. Or if not already completely supplanted, then threatened to be confined to certain genres such as historical and costume films. With Film ab!<font color="#FFFFFF">.</font> Six and Petritsch recall this moment of the collective subject without individual protagonists or storyline specifications. However, in contrast to Eisenstein and Co., they leave the political purpose of this subject completely open. They do so by as it were hollowing out the foundations of the form of staging of mass scenes. It does not only remain completely unspecified for what<font color="#FFFFFF">.</font> reason 5,000 extras should gather on a May afternoon in 2007 — except in fact to generate a mass scene, but also any kind of instructions are omitted, both for those present at the location as well as with regard to possible documentation of the event. The framework of action is confined, so to speak, to the pure formality of the transaction of a contract — for example, one of the “main acts” of the project is that each individual is paid his/her promised fee as an extra. Following this, also regulated by contract, the campus is cleaned to remove all traces of the event in no time at all. 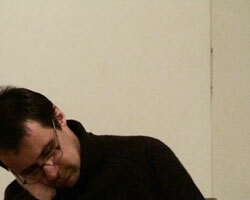 An audio–visual documentary is not planned by the artists but is also not expressly prohibited. still bears superficial features of deflated power fantasies. But even this phantasm quickly dissolves to nothing, the more so as the action men- tioned in the title, the actual shooting of the film, does not take place. With this gesture, which totally concentrates on transience and the nature of the process, the Kunst–am–Bau<font color="#FFFFFF">.</font> idea not least experiences a decisive shift. A main criterion of this idea still seems to lie in how a built structure can be used for visual, sculptural or other creative interventions. The concept behind it sees architecture primarily as a kind of screen to which art can be applied with a brush or a projector. 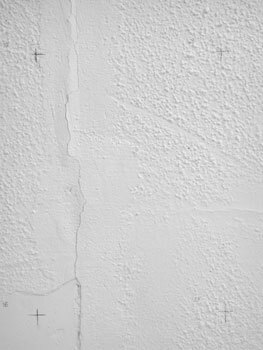 The problems which this poses, especially when buildings change their function or the layers applied to them begin to crumble, are well known and need not be repeated here. Six and Petritsch do not avoid this basic idea but radicalise it. It is not that the newly constructed building is a screen but the whole environment of the building in which the new structure only occupies one place (even if is central). Instead of being a projection surface, it give the conceptual impulse for the action Film ab!<font color="#FFFFFF">.</font> and functions — not permanently but only for the duration of one afternoon — just as much as a part of the staging as the whole surrounding area. Film ab!<font color="#FFFFFF">.</font> makes the Kunst–am–Bau<font color="#FFFFFF">.</font> concept dynamic in that nothing adheres to the building except the potential memory of it having been the setting of a mass scene: not as a once–and–for–all stipulation but as an exemplary stimulus to manifold imaginary uses. These may be transient and variable but because of this they are in no way less explosive. Instead of putting a permanent stamp on architecture, they point towards its ideal expandability and what are today perhaps unforeseeable ways of using it. The 5,000 extras thereby take on a catalytic function. In that a mass of extras — one time, randomly and temporarily — fills a campus for one afternoon and then leaves again — this variable occupancy is shown. In this way the extras make a kind of background story appear which — open to a variety of uses — lends the built scenario an additional dimension. It is as if the statics of the place depend above all on this variability and flexibility, as the many extras brilliantly demonstrate. Statisten nennt man gemeinhin jene Personen, die eine Szene anreichern, ohne selbst aktiv in Erscheinung zu treten. Die zur Lebendigkeit und Realitätsnähe eines Bildes beitragen, ohne den Hauptfiguren die Show zu stehlen. Statisten sind für die Rahmung eines Geschehens in dem Maße unerlässlich wie sie, als eine Art bewegter Hintergrund, einem Szenario Festigkeit und Zusammenhalt, ja eine gewisse Statik verleihen. Für die vordergründige Handlung mögen sie nicht viel mehr als eine lebende Tapete abgeben, doch für die Einheit eines Bildes stellen sie fast so etwas wie die tragende Grundierung dar. Die Platzierung von Statisten in einer Szene scheint demnach tatsächlich etwas mit angewandter Statik zu tun zu haben. Bezeichnend ist, dass man Statisten im Englischen „Extras“ nennt. Jene speziellen Zusätze also, die dazu beitragen, Ausstattung und Komfort zu verbessern, aber auch das grundlegende Funktionieren eines Akts, einer Szene, einer Einstellung durch den eigentümlichen Mehrwert, den sie mit sich führen, zu optimieren. „Extras“ könnten auch als spezieller Bild-Überschuss gesehen werden – jene tragenden Bestandteile, die man selbst nicht notwendig wahrnimmt, ohne die aber eine merkwürdige Leere und Brüchigkeit vorherrschen würde. Erst wenn man sich dezidiert der Rolle von Statisten zuwendet, kommt man dem Funktions- zusammenhang eines Bildes, dem Wechselspiel von Figuren und Hintergrund, von Handlung und deren Verortung, von Dynamik und Unbewegtheit auf die Spur. Erst der Fokus auf die vielen unscheinbaren „Extras“ lässt die Feinmotorik eines bildlichen Ensembles erschließen. Film ab!<font color="#FFFFFF">.</font> von Nicole Six und Paul Petritsch setzt genau bei solchen scheinbaren Nebensächlichkeiten an. Nebensächlichkeiten und Abschweifungen, die in den Mittelpunkt des Geschehens rücken und den gängigen Bedeutungskonnex zwischen einem architektonischen Setting und dessen primären Handlungskomponenten, von seiner Kunst- ausstattung hin bis zu den dort täglich anzutreffenden Akteuren, nachhaltig unterlaufen. Die Verschiebung, die Six und Petritsch mit ihrem Kunst-am-Bau-Projekt am Campus der Universität für Musik und Darstellende Kunst vollziehen, umfasst mehrere Ebenen: ortspezifisch – auf den Produktionsort der Filmstudios bezogen – bildgrammatisch – mit der gezielten Generierung einer Massenszene – und nicht zuletzt künstlerisch-architektonisch – anstelle einer bleibenden gestalterischen Intervention findet ein ephemeres Ereignis statt. Auf all diesen Ebenen lenken sie die Aufmerksamkeit hin auf spezielle Überschüsse, auf „Extras“ im oben beschriebenen Sinn, die man auf Anhieb nicht in einem Kunst-am-Bau-Zusammenhang erwarten würde, die dafür aber umso deutlicher vor Augen führen, worin dessen neuralgische und mitunter störungsanfälligsten Stellen liegen. Da ist zunächst der Ort selbst, der kubische Neubau des Filmstudio- gebäudes auf dem Campus der Universität für Musik und darstellende Kunst. Wie verlockend muss es doch gewesen sein, die planen, großteils fensterlosen Außenwände mit allerlei Referenzmaterialien aus Film- und Medien zusammenhängen zu bespielen. Mit Reminiszenzen an die Kinogeschichte, Samples der an diesem Ort verhandelten Sujets, oder vielleicht sogar als Werbefläche für die darin produzierten Studenten-Arbeiten. Nichts von alledem. Als gelernte Architekten greifen Six und Petritsch nicht in die rasterartig gestaltete und geometrisch ausgewogene Fassade ein. Stattdessen begreifen sie den Umraum des Gebäudes, einen neu gewonnenen Platz, als ihre primäre Spielfläche – ein Forum der besonderen Art, das sich kalkuliertermaßen von einer bestimmten Anzahl von Personen nutzen lässt. Film heißt nicht unbedingt Star-Ensemble, sondern mitunter auch anonyme Massenproduktion, und wo sonst als in diesem zentral mit dem Neubau bestückten Außenraum ließe sich ein solche umsetzen? Indem Six und Petritsch zu einem Mittel der filmischen Inszenierung greifen, führen sie nicht nur den Funktionskontext des Gebäudes vor Augen, sondern verschieben diesen in Richtung einer speziellen, meist ganz teuren (oder ganz billigen) Produktionen vorbehaltenen Inszenierungsform. Film und Masse, letztere meist nur am Rezeptionsende des Kinomediums wahrgenommen, werden so in einem ihrer ursprünglichen Überschneidungsmomente zusammengeführt. In dieser Zusammenführung ist, wie bereits angedeutet, eine grund- legende Verschiebung am Werk. Üblicherweise fungieren die Masse bzw. die sie verkörpernden Statisten im filmischen Zusammenhang als Hintergrund einer Handlung – als anonyme, undifferenzierte Folie, von der sich die ProtagonistInnen in ihrer Individualität abheben. Dagegen existiert eine filmhistorische Linie, aus dem frühen Kino kommend, über Benjamin und Krakauer bis hin zum sowjetischen Revolutionsfilm, der zufolge die Masse selbst zum Akteur werden kann. Nicht als milieuhafte oder soziale Grundierung einer Szene, sondern als kollektives Subjekt, das sich selbst als Handlungsinstanz begreift – so wie dies Eisensteins Panzerkreuzer Potemkin oder Oktober<font color="#FFFFFF">.</font> eindrucksvoll vorführen. Eine Masse als Masse zu inszenieren, und nicht als Hintergrund eines speziellen Aktes, schreibt sich in diese filmgeschichtliche Tradition ein – eine Tradition im übrigen, die mit dem Überhandnehmen des Hollywoodkinos immer mehr in Vergessenheit zu geraten scheint. Oder wenn schon nicht ganz verdrängt, so doch auf bestimmte Genres wie den Historien- und Kostümfilm beschränkt zu werden droht. 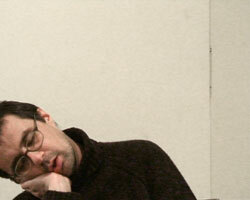 Six und Petritsch rufen mit Film ab!<font color="#FFFFFF">.</font> dieses Moment des kollektiven Subjekts, ohne individuelle ProtagonistInnen bzw. Handlungsvorgaben, in Erinnerung. Allerdings lassen sie, anders als Eisenstein und Co., die politische Bestimmung dieses Subjekts gänzlich offen. Sie tun dies, indem sie die Inszenierungsform der Massenszene gleichsam in ihren Grund- festen aushöhlen. Denn nicht nur bleibt völlig unbestimmt, wozu<font color="#FFFFFF">.</font> sich die 5.000 Statisten an dem Mai-Nachmittag 2007 versammeln sollen – außer um eben eine Massenszene zu generieren. Vielmehr wird auch jegliche Handlungsanweisung, sowohl an die sich vor Ort Einfindenden wie auch im Hinblick auf eine eventuelle Dokumentation des Geschehens, ausgespart. Der Handlungsrahmen beschränkt sich, wenn man so will, auf die pure Formalität der Abwicklung eines Auftrages – so wird beispielsweise, als eine der „Hauptaktionen“ des Projekts, jedem/r Einzelnen das ihm/ihr vertraglich zugesicherte Statisten-Honorar ausbezahlt. Im Anschluss daran wird, ebenfalls per Vertrag geregelt, der Campus gereinigt, um jegliche Spuren des Ereignisses im Handumdrehen zu beseitigen. Eine audiovisuelle Dokumentation ist von den KünstlerInnen nicht vorgesehen, wird aber auch nicht ausdrücklich untersagt. In dieser Öffnung bzw. Unterwanderung des insze-nierten Massen-Events kommt zweierlei zum Ausdruck. Zunächst erfolgt damit ein Brückenschlag zwischen der erwähnten Tradition filmischer „Massen-Subjektivierung“ hin zur situationistisch angehauchten Spontan-Aktion. Spontan mag hier nicht das richtige Wort sein, da das Ereignis ja minutiös und monatelang geplant ist, aber die Inszenierung einer Massenzusammenkunft, rein um der Zusammenkunft willen, trägt durchaus Züge jener Traditionslinie, die vom ziellosen Umherschweifen in den Straßen bis hin zu kurzfristigen Sit-ins, Platzbesetzungen und so genannten „Flash Mobs“ reicht. Heute mag jede tragfähigere bzw. längerfristige Perspektive solcher Aktionsformen verflogen sein, aber Six und Petritsch stellen genau dieses Fehlen einer gemeinsamen Agenda, eines kollektiven Projekts, zur Diskussion, indem sie die vorübergehende Bildung eines Menschenschwarms und dessen anschließende Auflösung gleichsam als formellen, jeglicher Inhaltlichkeit entleerten Akt exponieren. Die Masse ist in Film ab!<font color="#FFFFFF">.</font> jeder Macht entkleidet; allenfalls trägt sie noch oberflächliche Züge entleerter Machtfantasien. Aber selbst dieses Fantasma löst sich schnell in nichts auf, zumal die im Titel angesprochene Aktion, der tatsächliche Filmdreh, ausbleibt. Mit dieser Geste, die ganz auf Vergänglichkeit und Prozesshaftigkeit setzt, erfährt nicht zuletzt die Kunst-am-Bau-Idee eine entscheidende Verschiebung. Ein Hauptkriterium dieser Idee scheint nach wie vor darin zu liegen, wie sich eine gebaute Struktur für visuelle, skulpturale oder sonstige gestalterische Eingriffe nutzen lässt. 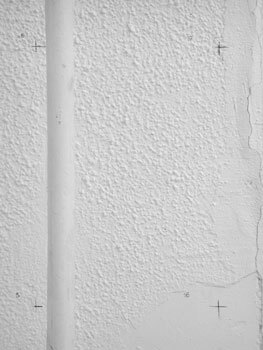 Das Konzept dahinter sieht die Architektur primär als eine Art Leinwand, auf die sich Kunst wie mit dem Pinsel oder einem Projektor auftragen lässt. Die Probleme, die dies aufwirft, vor allem wenn Gebäude ihre Funktion ändern oder die darauf aufgetragenen Schichten zu bröckeln beginnen, sind bekannt und müssen hier nicht wiederholt werden. 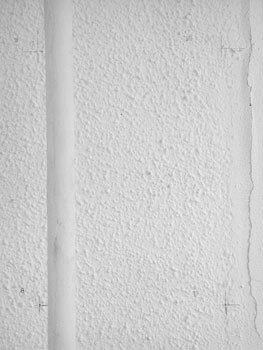 Six und Petritsch weichen dieser Grundidee nicht aus, sondern radikalisieren sie: Nicht das neu errichtete Gebäude ist eine Leinwand, sondern die gesamte bauliche Umgebung, in welcher der Neubau nur eine (wenn auch die zentrale) Stelle besetzt. Anstatt Projektionsfläche zu sein, gibt er den konzeptuellen Anstoß zu der Aktion Film ab!<font color="#FFFFFF">.</font> und fungiert – nicht permanent, sondern einen Nachmittag lang – ebenso als Teil der Inszenierung wie der gesamte umliegende Bereich. Indem nichts an dem Gebäude haften bleibt außer der potenziellen Erinnerung, einmal Schauplatz einer Massenszene gewesen zu sein, dynamisiert Film ab!<font color="#FFFFFF">.</font> den Kunst-am-Bau-Gedanken: nicht als ein für allemal getätigte Fest- schreibung, sondern als exemplarische Anregung zu vielfältigen imaginären Nutzungen. Diese mögen vergänglich und variabel sein; weniger brisant sind sie deshalb keineswegs. Anstatt der Architektur einen bleibenden Stempel aufzudrücken, weisen sie auf deren ideelle Erweiterbarkeit und heute vielleicht noch nicht vorhersehbare Verwendungsweisen hin. Den 5.000 „Extras“ kommt somit eine katalytische Funktion zu. Indem eine Masse von Statisten – einmalig, zufallsbedingt und vergänglich – einen Nachmittag lang den Campus füllt und anschließend wieder räumt, wird dessen variable Besetzbarkeit vor Augen geführt. Die „Extras“ lassen auf diese Weise eine Art Handlungshintergrund hervortreten, der, vielfältig bespielbar, dem gebauten Szenario eine zusätzliche Dimension verleiht. So als würde die Statik des Ortes, wie die vielen Statisten brillant unter Beweis stellen, vor allem von dessen Variabilität und Beweglichkeit abhängen. With their display for the Belgrade presentation of the Art Collection of Erste Bank Group, Nicole Six and Paul Petritsch created an imaginative space which ingenuously follows the logic of presented art. 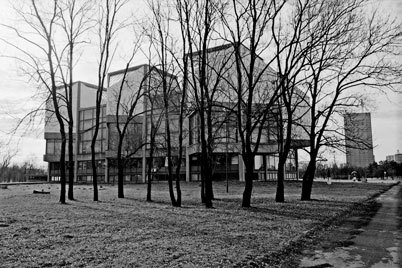 The Museum of Contemporary Art, an important component of New Belgrade, was opened on the left bank of the Sava River in 1965. Ivan Antić and Ivanka Raspopović had designed this manifesto–like building in the spirit of international structuralism, following the CIAM Conference of 1959, which had brought together the most important positions of the European modernist avant–garde. It was a master-piece for the self–image of socialist Yugoslavia and the third way, which the multi–ethnic state had rhetorically assumed between the blocs towards such significant modernist architecture. The design even develops sculpture and pattern within itself as a free sequence of rooms, a museum made up of a path and space with visual connections between the floors and to the exterior (to historical Belgrade on the opposite bank). It was an ideal mantle for the spatial fantasies of modernist art, particularly the sculpture of those years, which more and more also became the state art in Titoist Yugoslavia. And to bring it into connection as a place with more open display requirements of modern painting, this building forms, so to speak, the counter thesis to the art of those of the avant–garde beyond the Iron Curtain and in Austria and Yugoslavia who were critical of modernism, who were to be presented in the Erste Bank Group exhibition. In its historical references, this was the complex starting point that presented itself to Nicole Six and Paul Petritsch for the design of a display for the Kontakt collection in Belgrade. An ideologically outdated architecture, which is nevertheless strongly and rhetorically present which had also seen better days from a conservation point of view, and the two remained—monolithic in its gestures and totalitarian in its basic structural concept. 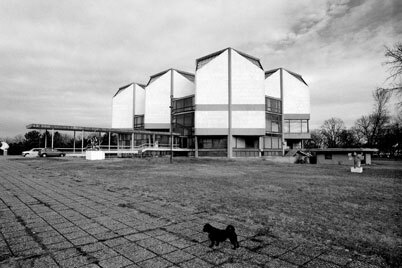 A collection had to be integrated into it, which in its significant parts stands in contradiction to structuralism and the abstraction of high modernism that the building embodies. A collection which places works which have only gradually been taken into the western canon in a conceptual tradition and which—because of their contextual and local position among other things—have the potential to question it radically. It is a collection representing artists who critically faced the various modernisms of their local contexts from the 1960s. 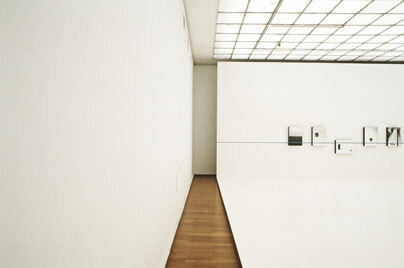 In the first presentation of the collection it was the motif of the wall, which divided and structured one of the large side halls of a standard floor of the Vienna Museum of Modern Art, which operated both as a metaphor for avant–garde development at the time, divided into blocs, and as an ideal picture presentation surface for the often small formats—the intimacy due to the opportunities for public presentation and production. The location for this was a building with a rhetorically only apparently informal exhibition architecture, which in its use of material and space—monumentally excessive in its mantle and its interior economically and rationally following the product logic of an office building—is derived from a neutrally conceived investment architecture of the 1990s. This wall was duplicated by an oversized surface on the floor designed as a presentation table, so to speak a wall laid in the room, a wall lying on the floor on which a parade of objects which were able to evolve from such diverse, logical aesthetic and production connections as Yugoslavia of the late 60s, Bratislava of the same period and Prague of the leaden 70s. 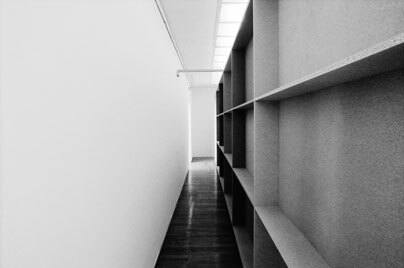 A polylogue rich in lines of sight arose between the lying and the standing wall, the side cabinets with media works and the work groups arranged loosely in the space at the walls of the museum. 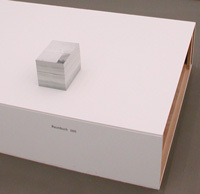 The neutral spatial logic of the un–specified cube which the Vienna museum presents strategically foiled this staging and created a stage rich in references for the presentation of otherness and the parallel development of artistic avant–gardes in Eastern and Southeastern Europe which was able to develop pictorially beyond practiced post–war writing of history which western museums often imagine as still unbroken. 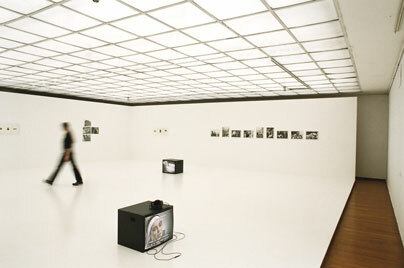 For the presentation in Belgrade and at a historical moment that may have felt claustrophobic for many of the former Belgrade proponents of the new art practice of the 1970s who are represented in the collection, Six/Petritsch chose a contrary strategy: the precariousness of their arrangement lies in the inversion of the museum. The display concept takes the contrary historical position, like a parasite in its own house, so to speak, to the exemplary model of a structural architecture that allows open viewing relationships. Nicole Six and Paul Petritsch answer the question of a Belgrade perspective on art from the area of the former Warsaw Pact and Austria by denying an open view. In this exhibition architecture, the modernist opposite of a white cube—a spatial continuum clearly defined through viewing and relationship axes, such as the Belgrade building—is almost barricaded from the inside by four 1:1 models of white cubes. 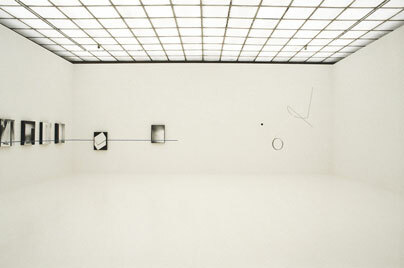 In the structure of the standard floor of the building they force themselves narrowly against the walls of the exhibition rooms like boxes set up as a second opposing frame and reverse and center the fluid lines of sight, also directed to the outside, of those passing through, which was favored by the design of the 60s. 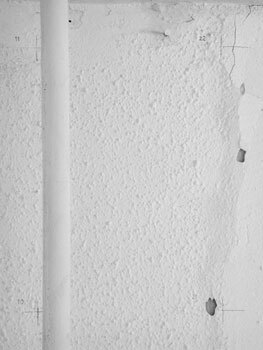 The new stage boxes made of white-painted chipboard held together with wooden bolts whose floors, made of the same painted chipboard, are raised above the level of the museum floor and which the visitor sometimes first reaches via new, long corridors which arise between the parasitical structure and the original construction, create a neutrality almost without context in which the works of the collection are placed in relationship to each other almost like chamber pieces—intimacy instead of agora and public appearance. Also the good view to the outside, with which the museum brings together the old and the new city, is broken and the views over the city appear as commentaries of critical picture constructions. The dividing lines are sharp, the interferences large. 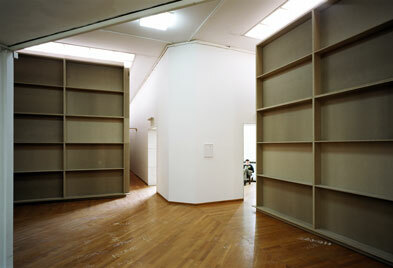 At the same time this intervention by Six/Petritsch also expresses the borders between paradigms. Criticism finds its expression itself in the construction of the display without having to trouble post–modern metaphorics or sidestep into neo–modern neutrality. The historical transition between the two forms of display is an image for the interrupted and discontinuous history of the avant–gardes that the collection brings together and thus enters a formal dialogue with the art, which follows parallel developments. With this paraphrase of the western white cube Six/Petritsch have not only placed an image for the attack which art started upon it in the spaces in the grid structure of a building of high modernism. The corridors between the substance of the old building and the intervention of the display then almost become a symbol for cultural difference and translate the perspectives of the collection into an architectonic abstraction. 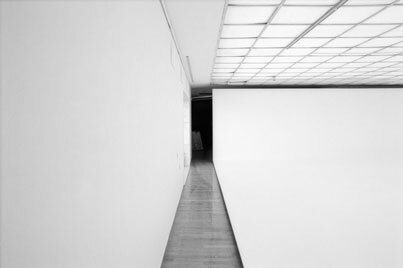 In this way the real space of the museum is transformed into a metaphorical space and the real space of the display—that of the white cube used in the exhibition architecture of high modernism—suddenly becomes a theoretical space. 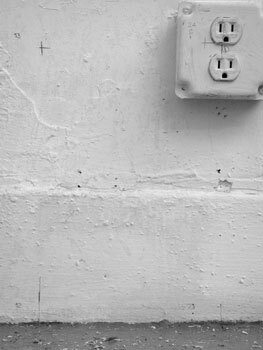 Architecture and sculpture are grounded. Buildings and three-dimensional works of art stand on the ground, are erected on foundations or placed on bases. Their links with the earth are just as important as their vertical extension. It surely cannot be accidental that, since time immemorial, metaphors of standing, sitting and lying as applied to buildings and sculpture have been widely used to express certain thoughts. Building on solid ground would appear to be a logical metaphor of safety and stability. By contrast, classic Western thought lacks verbal imagery for expressing phenomena of an inherently different kind, for qualities that combine the firm with the movable, the architectural with the psychological, the established with the unfathomable. These phenomena, rather than conventional architectural categories, are what matter to Nicole Six and Paul Petritsch. They focus not on erecting, installing or siting, but on existential conditions in which stability has begun to crumble, in which security is undermined in order to allow states of disorientation to be registered and investigated. The two artists like to render such states through the depiction of space. A lack of firm structuring and a feeling of bewilderment become especially apparent in spaces that have neither boundaries nor coordinates. Such sensations also occur in situations that disrupt human actions and perceptions, either rendering them useless or at least seriously threatening them. Six and Petritsch subject themselves, and hence the viewer, to extreme conditions of this kind. In their work they generally expose themselves to states of risk in which they are apparently deprived of space, in which bearings are lost and automatic assumptions no longer apply. How can risk be expressed in artistic terms? How can a work of art impart the feelings of astonishment and horror involved, the fear and insecurity? How can deprivation be conveyed? Six & Petritsch concentrate on how the body expresses inner awareness of external phenomena. Taking psychological and physical stress as their starting point, they use their own bodies as a test case. Their principal tenet is as obvious as it is phenomenological: people have space. They encompass space and they displace it with their bodies. Unlike architecture and sculpture, which are inert, people can make space tangible. In other words, they not only displace space, they also perform actions in it and appropriate it. In doing so, they generate new spaces and fix them—through movement and other activities, for example, but also through failing to act. Extending beyond the limits of our bodies, our senses, too, encompass space. We become aware of this whenever we speak, pant, listen, look and so forth. Perceptual acts that involve space reassure us vis-à-vis reality. Yet the moment they move beyond certain limits they are jeopardised and eventually obliterated by distance. Seeing knows no echo, listening no horizon and speech no communication unless it is vouchsafed a response. All too rarely do we register the fact that the signals we transmit are meaningless without feedback, that they must reach something outside us that returns them. Only that which has not been lost in infinity can be seen, heard and spoken. Six and Petritsch seek to abolish the security provided by such responses, to undermine communicational control, to find places and situations that are largely indeterminate and unexplored. 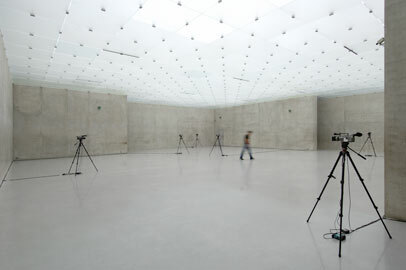 The artists thus have a penchant for sites that tax perception and the senses to an exceptional degree: expanses of grey ocean, a gap between buildings, a boundless landscape of ice, an empty, whitewashed room and now, in Bregenz, a featureless, artificial, concrete space bathed in cold light. Places like this, low in stimuli, expose the limitations of humanity’s supposed mastery of nature and show it to be illusory. Whenever human appropriation of nature meets its limits, active physical mastery and the visual exercise of power soon give way to self-doubt and confusion. Only when paths mapped out by the Self become indistinct, when perception and the body are threatened with extinction, when we find ourselves in a state of sensory and physical deprivation—only then can loss of orientation via our surroundings lead to a reflection of, and reflection on, our inner selves. 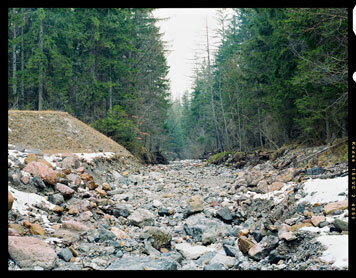 The paradoxical notion of ‘endurance’ embodies this state and reveals its workings. Endurance requires effort, effort directed both outwards and inwards. Anyone wishing to endure must come to terms not only with external factors, but also with themselves. Endurance entails both active resistance and passive power. Bereft of feedback, we are reduced to a state of pure being, to inactivity, to waiting and to observing our own pointless motions. Six & Petritsch make us party to excursions into lifeless environments that correspond to our inner world and its split character in that they evade our perceptual grasp. In such spaces, deprived of responses and the possibility of escape, the Self is experienced more intensely, as an ambivalent, ungrounded subject that adopts a defensive attitude towards something that is not really there. Nothingness cannot provide feedback. Opposition to nothingness is affirmative only in the sense that a double negative is affirmative and it is therefore experienced physically as effort and psychologically as senseless. An early video of Paul Petritsch on a frozen lake articulates existence in a space offering no responses by showing the protagonist combating something not present, a type of art prefigured in the 1960s in the work of Bruce Nauman, Chris Burden, Bas Jan Ader and Timm Ulrichs. We see a person cutting a circle around himself in the ice. The effort involved is revealed by his heavy breathing, leaden movements and increasingly frequent breaks. The little round disc by which the forlorn hero separates himself from the outside world is a substitute for genuine resistance. The circular abyss opening up around him is centred in his person, offering a contrast to geographical description, which deals only in straight lines and knows no centres. It would be a mistake to assume that this symbolises human beings as the measure of all things. Six and Petritsch do not see it as their task to uncover the centre of humanity or its inner spaces. On the contrary, they seek to investigate the experience of boundlessness, bottomlessness and arduousness undergone by the Self when exposed to extreme situations and to show how this expresses itself externally. The artists’ approach therefore differs fundamentally from that of architects from Vitruvius to Le Corbusier, who took the human body as a yardstick and thus failed to incorporate, or deliberately excluded, the experience of infinite space. The disc on which Petritsch stands, and the abyss it ultimately signifies, is defined by a mark in the ice. The surface is flat but, cut from the ice, will eventually tip fatefully. This floe, wrested from a hostile infinity and an obdurate material world, will mutate from an object fashioned with a great expenditure of effort into a bottomless pit, from a platform into an abyss. The obstinate endurance that constitutes the protagonist’s resistance is horizontal in orientation: it opposes the world laterally. Thus, the vector involved, like the other two bodily motions favoured by Six & Petritsch, tottering and falling, is quite different from that entailed in erecting something. A sequence of photographs showing Petritsch leaping through a hole in a wall into a gap between buildings offers another example of the same thing. The images record this dangerous jump, and the fear and courage it involved, but not the moment when Petritsch hits the ground. The fall results from the disappearance of a secure base. 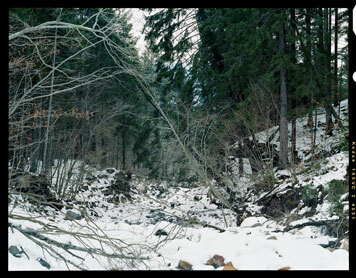 Despite the dispassionate aesthetic, the photographs give expression to factors of disorientation that feature constantly in Six and Petritsch’s work: unfathomableness, bottomlessness, irresistible pulls, loss of balance, the inevitability of disaster and the limitation of personal activity to ‘semi-deeds’. Eschewing words, Six and Petritsch use an eloquent language of signs, usually bodily signs, to record such states. This art may remind one of Expressionism in that it addresses endangerment, disaster and angst, but it goes beyond Expressionism by transforming these elements into components of a self-induced, profoundly introverted kind of risk. Other associations arise. One thinks, for example, of heroic nineteenth-century images of workers who symbolise the confidence and determination of their class. Six and Petritsch, however, show not the positive value of work, but its senselessness. 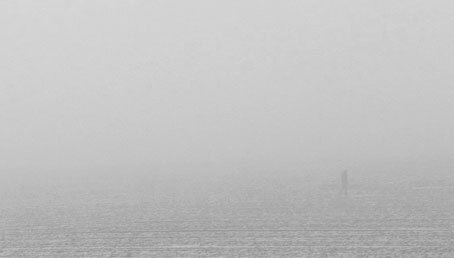 Similarly, the Romantic aura of grey, metaphysical mist enveloping the icebreaker and his surroundings in the video is subverted by the cool, matter-of-fact way in which the scene is documented. The boundless totality of nature, the Self’s numinous opposite number, is not evoked lovingly in details that stand for the whole; rather, it is ignored, as someone is shown performing a pointless act that has been insufficiently thought-through and is clearly the result of desperation. Sentimentality is excluded completely. We can only guess what has driven the protagonist to engage in his fateful activity, yet he conveys the impression that the work must be done, even if it proves fruitless and may cost him his life. He will perish, with no firm foundation for the ice on which he stands and with no firm foundation for his act. His work is not constructive: it is creating nothing and will not help overthrow the existing social order. If successful, all it will achieve is an end to fear. 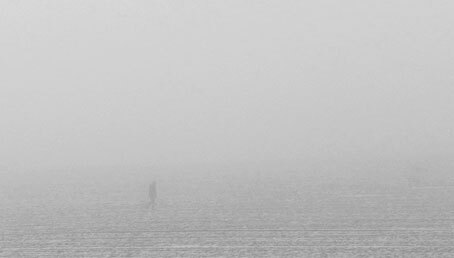 Anyone entering emptiness—a landscape of ice, a bare, box-shaped room, the open sea, a cubic void, the desert—is in search of an ideal platform for minimising the world and themselves from a particular viewpoint. Siting ourselves in places that defy precise location disrupts our feelings of self, our orientation in the world and our sense of belonging to others and society. With nothing but bareness, such remote places might seem to offer us a higher form of existence through renunciation. In fact, all that is open to us is to probe space in a series of inherently contradictory, relatively aimless bodily motions and to ascertain the presence of nothingness. In other words, by occupying the space with volumes and perception, we ensure that it retreats still further. As with every retreat, nearness will eventually metamorphose into farness, presence into absence, achievement into oblivion. 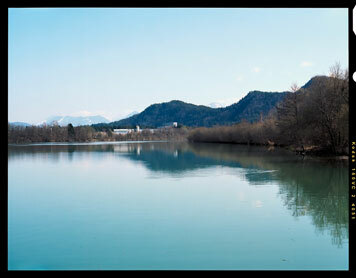 In his site-specific work in Bregenz, Petritsch will place himself in such an exceptional situation. 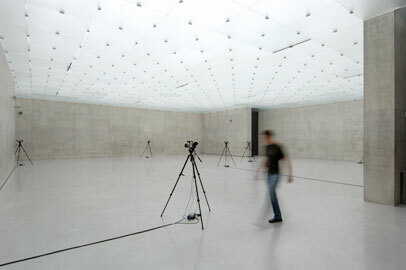 He will spend six days in the bare exhibition space on the fourth floor of the Kunsthaus, filmed by six video cameras. He will not communicate with the outside world. His observation of his own body will be the only apparent interaction with his surroundings. 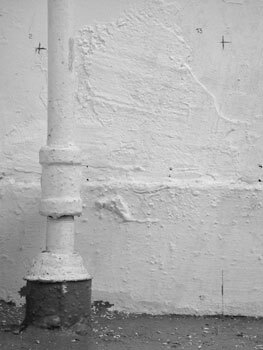 The longer he stays within the concrete walls, the more Petritsch will lose control and lose his Self. He will sit down, lie down and adopt other positions not in order to take up a pose or make a point, but because he cannot escape his body or the functionless room into which he has delivered himself. Here, as elsewhere, he will consciously embrace what most people are generally anxious to avoid: states in which there is no feedback and no possibility of escape, vulnerable states and in-between states. This indefatigable seeker after meaning does this because only when he encounters space in the intangible form of a vacuum and void, only when he confronts it in a way that makes him loses his equilibrium and his customary experiential framework—only then can that space become a mirror and vehicle of the Self. In large-scale, real-time video projections visitors to the Kunsthaus will be able to observe Petritsch in the grey surroundings of the room. By the time they do so, however, this physically and psychologically exhausting event, during which nothing happens, will have run its course: the protagonist is to leave the room before the exhibition begins. Hence, viewers will see a document of something that already belongs to the past. The images will be a none the less precise record for that, testifying to the pain of this self-experiment, to the silence, the perseverance, the endurance and the angst. 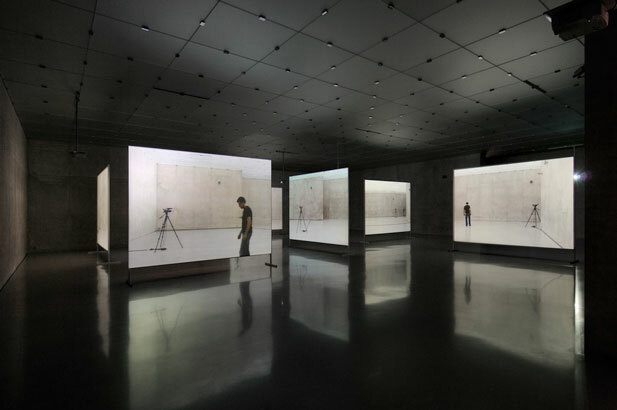 The room the artist exposed himself to will be turned into its own Doppelgänger, the cameras removed and their place taken by full-size membranes that put visitors in a state of spatial confusion. The work is best understood as an attempt at combating fear, at coming to terms with angst, through an almost monastic process of focusing on activity that consists of nothing more than doing nothing. For outsiders, this individual’s state of being abandoned to himself will be perceptible only indirectly, via medial presentation, not through personal experience. The humiliating conditions willingly embraced by the protagonist will appear merely as visual data symbolic of the existential helplessness, groundlessness and inscrutability that Petritsch himself actually experienced and that the Self can never really escape. Architektonik und Skulptur haben einen Grund. Gebäude und plastische Kunstwerke werden auf Gründe aufgesetzt, auf Fundamente gebaut oder Postamente gestellt. Die Verankerung im Boden ist ebenso wichtig wie das räumliche Aufragen in die Höhe. Es ist interessant zu bemerken und wahrscheinlich nicht zufällig, dass die Metapher des Setzens, Stellens und Liegens, die sich in der Architektonik äußert und für die Skulptur so gerne in Anspruch genommen wird, in den Denkanstrengungen von alters her großen Raum einnimmt. Es scheint, als sei das Bauen auf Grund die ideale Metapher für die Logik von Sicherheit und Festigung. Im Gegensatz dazu mangelt es dem klassischen abendländischen Denken an einem sprachlichen Bild für anders gerichtete Phänomene. Angesprochen sind Eigenschaften, in denen das Feste mit dem Beweglichen verknüpft wird, das Architektonische mit dem Psychischen, der Grund mit dem Unergründlichen des Daseins. Für Nicole Six und Paul Petritsch zählen diese und nicht die herkömmlichen Kategorien des Architektonischen. Denn es geht den beiden nicht um das Aufrichten, Aufstellen oder Zum-Liegen-Kommen, sondern im Gegenteil, um Zustände, in denen die Standfestigkeit ins Wanken gerät, das Sicherstellen Fehlschläge erleidet und ungefestigte Existenzformen registriert und aufgespürt werden können. Wer die Kunstwerke der beiden näher betrachtet, wird feststellen, dass jene Zustände bevorzugt über eine Erfahrung des Raumes zur Darstellung kommen. Verunsicherung, Bodenlosigkeit und Schwindelgefühl zeigen sich vor allem in und an Räumen, denen Randmarken und Koordinaten fehlen. Sie zeigen sich aber auch in Situationen, in denen menschliches Handeln und Wahrnehmen einer Irritation, einem Scheitern oder zumindest einer heiklen Ernsthaftigkeit ausgesetzt sind. Six/Petritsch versetzen sich – und damit auch die BetrachterInnen – in solche Extremlagen. Charakteristisch gelangen sie in Zustände der Gefährdung, in denen der Raum sich entzieht, in denen man den Überblick verliert und aus seiner unbewussten Selbstverständlichkeit heraus bricht. Wie aber kann sich Gefährdung äußern? Wie können in der Kunst jene Gefühle des Staunens und Schauderns, der Angst und Verunsicherung vermittelt werden? Wie lässt sich Entzug aufzeigen? Six/Petritsch verweisen auf das Innewerden des Äußeren und die körperliche Erfahrung, die damit einher geht. Ihr Ausgangspunkt ist die psycho-physische Belastung, probiert am Testfall des eigenen Körpers. Die Überlegung, die allem voran geht, ist ebenso nahe liegend wie phänomenologisch. Der Mensch selbst besitzt Raum. Dieser ist in ihm, zudem verdrängt er ihn durch sein Volumen. Im Unterschied zu Architektur und Skulptur, die reglos in sich verharren, kann der Mensch Raum auch greifbar machen. Das heißt, er verdrängt nicht nur Räumliches, sondern er kann auch im Raum handeln und ihn einnehmen. Dabei wird er andere Räume errichten und zum Ruhen bringen. Zum Beispiel über Bewegung, Tun und Handeln oder auch durch die Unterlassung von Handlungen. Ebenso können die Sinne, die sich weiter erstrecken, als es die körperlichen Maße erlauben, Räumliches auftun. Wer spricht, keucht, schläft, hört und sieht, wird dessen gewahr. Die Wahrnehmungen, die Räume erschließen, lassen das Wirkliche dann erträglicher erscheinen. Sobald sie aber Grenzen überschreiten, werden sie prekär und verlieren sich in der Ferne. Das Sehen besitzt kein Echo, das Hören keinen Horizont, die Sprache keine Verständigung, wenn sie nicht beantwortet wird. Zu selten wird uns bewusst, wie sehr die Appelle, die wir aussenden, einer Rückkopplung bedürfen, eines Widerstandes von Außen, der das Eigene beantwortet und zurück gibt. Nur solches kann gesehen, gehört und gesprochen werden, was sich nicht im Unendlichen verliert. Six und Petritsch versuchen, sich der Versicherung der Antwort zu entziehen, kommunikative Kontrollen zu unterbinden, Orte und Situationen zu wählen, die weitgehend unbestimmt sind und brach liegen. Bevorzugt werden daher Orte ausfindig gemacht, an denen die Wahrnehmung überfordert und die Sinne strapaziert werden: das weite graue Meer, eine vergessene Baulücke, eine horizontlose Eislandschaft, ein leeres, weiß getünchtes Zimmer und nun, in Bregenz, die in kaltes Licht getauchte Betonlandschaft eines anonymen Kunstraumes. Bedeutsam wird, wie sehr an diesen reizarmen Stätten die Beschränkung eingemahnt wird, und wie die Illusion von der Verfügung des Menschen über die Natur an Grenzen stößt. Handelnde Naturbeherrschung und visuelle Machtausübung geraten dort, wo Aneignung misslingt, in Selbstbefragung und Bodenlosigkeit. Nur dort nämlich, wo die Bahnen des Ichs flüchtig werden, wo Wahrnehmung und Körper verloren zu gehen drohen, im Entzug, kann der Verlust des Außenraums zugleich zum Anlass einer inneren Spiegelung werden. Ausgetragen und anschaulich wird dies am paradoxen Begriff des Aushaltens. Das Aushalten ist ein Zustand der Anstrengung, der sich ebenso nach außen wie nach innen richtet. Wer etwas aushält, muss nicht nur Fremdes, sondern auch sich selbst ertragen. Aushalten ist aktive Gegenwehr ebenso wie passive Kraft. Der Mensch bleibt ohne Antwort seiner puren Befindlichkeit, dem Nichtstun, dem Warten und der Beobachtung des eigenen nutzlosen Bewegungsspiels überlassen. Six/Petrisch zeigen uns Expeditionen in leblose Umwelten, die insofern das Innere und seinen Zwiespalt repräsentieren, als sie sich der Fassbarkeit entziehen. In diesen Räumen des Antwort- und Ausweglosen, erfährt sich das Ich noch intensiver als ambivalentes, unbegründetes Subjekt, welches sich defensiv gegen etwas stemmt, das eigentlich nicht ist. Das Nichts bietet keine Rückkopplung. Das Widerstreben gegen das Nichts ist wie die doppelte Verneinung affirmativ und wird deshalb physisch als Anstrengung und psychisch als Vergeudung empfunden. Beispielhaft werden die Antwortlosigkeit und der Widerstand gegen das nicht Anwesende, die ihre Vorbilder in der Kunst der 60er Jahre etwa bei Bruce Nauman, Chris Burden, Bas Jan Ader oder Timm Ulrichs besitzen, in einem früheren Video, welches auf einem zugefrorenen See gedreht wurde. Eine Person ist dabei zu beobachten, wie er rund um sich einen Kreis aus der dicken Eisdecke frei hackt. Sie müht sich ab, die Anstrengung wird am beschwerlichen Atem, den lastenden Bewegungen und den mit dem Fortdauern der Arbeit häufiger werdenden Pausen ablesbar. Die kleine rundliche Zelle, die sich der traurige Held gegen die Außenwelt abzirkelt, ersetzt die Widerstände. Der Kreis des Abgrunds ist sichtbar um sein Selbst zentriert, anders als in der Geografie, die keine Mitte und nur Geraden kennt. Und obschon man annehmen könnte, der Mensch würde hier symbolisch zum Maß der Dinge, unterliegt man damit einem Missverständnis. Six/Petritsch sehen nicht darin ihre Aufgabe, die menschliche Mitte zu finden, auch nicht den Innenraum, sondern umgekehrt, den Erfahrungsgehalt des Unermesslichen, Beschwerlichen und Abgründigen zu zeigen, dem sich das Ich in Extremen ausliefert und sich selbst damit sichtbar nach außen stülpt. Die beiden schlagen damit einen vollständig anderen Weg ein als die vielen architektonischen Versuche der Geschichte, von Vitruv bis Le Corbusier, die den Raum nach dem menschlichen Körper bemessen und dabei die Erfahrung des Dimensionslosen verfehlen oder sogar absichtsvoll missachten. Was der Kreis zeichnet, ist die Markierung am Boden. Er ist flächig, aber durchbrochen und wird am Ende schicksalshaft kippen. So sehr nämlich diese Scholle der Feindseligkeit des Unermesslichen und der Hartnäckigkeit der materiellen Welt abgerungen wird, so sehr wird ihr Kräfte raubendes Streben in die eigene Bodenlosigkeit, die Fundamentfläche in den tiefenräumlichen Abgrund münden. Dabei ist es sehr wichtig zu sehen, dass das Aushalten, welches Widerstand leistet, horizontal orientiert ist. Es stemmt sich seitlich gegen die Welt. Wie die beiden anderen favorisierten Körperbewegungen, Schwindel und Sturz, werden von Six/Petritsch also körperhafte Vektoren ins Spiel gebracht, die wesentlich anders orientiert sind als das Aufstellen und Errichten. Beispielhaft wird dies in einer Fotoserie, in der der Künstler durch eine Mauer in eine Baulücke hinab springt. Nur der gefährliche Sprung, die Angst und der Mut sind dokumentiert, nicht das Aufschlagen auf dem Boden. Der Zug aber zum Boden ist die Antwort auf den Entzug des Befindens. Trotz aller ästhetischen Unterkühlung finden sich die Fremdheitsmotive wieder, welche die Werke von Six/Petritsch so charakteristisch durchströmen: das Fassungslose, der Sog, die Anziehungskraft des Grundlosen, der Verlust des Gleichgewichts, die Fesselung an das „Verhängnisvolle“, das dem Akteur zustößt, die Beschränkung des eigenen Tuns auf ein Beinahe. Six/Petritsch schildern diese Widerfahrnisse wortlos, aber in beredten, meist körperlichen Ausdruckszeichen. Wir befinden uns jenseits des Expressionismus, obwohl manches diesem ähnlich sein wird, die Gefährdung zum Beispiel, der Sturz und die Mühsal, jedoch gewendet in eine Art der Selbstgefährdung, die sich sehr introvertiert gebärdet. Auch andere Assoziationen werden aufkommen. Das 19. Jahrhundert kannte zum Beispiel den Bildnistyp des heldenhaften Arbeiters, der die Selbstsicherheit und Entschlossenheit seiner Klasse symbolisierte, doch Six/Petritsch zeigen nicht den Wert der Arbeit, sondern das Sinnlose der Anstrengung. Auch die Nähe zur Romantik, der metaphysisch graue Dunst, der den Eishacker und seine diffuse Umgebung einhüllt, wird durch die Kühle und emotionslose Aufzeichnung gebrochen. Das unendliche Reich der Natur, das numinose Gegenüber des Ich, wird nicht durch vereinzelte Schau von diesem herbeigesehnt, sondern durch ein sinn-loses Tun, welchem zureichender Grund mangelt und Hilflosigkeit anzusehen ist, geradezu missachtet. Keine Sentimentalität will aufkommen. Und es lässt sich nur ahnen, was den Akteur zu seinem verhängnisvollen Werk treibt, doch er vermittelt, dass diese Arbeit getan werden muss, wenn sie am Ende auch fruchtlos bleiben und vielleicht sogar sein Leben kosten wird. Er wird „zugrunde gehen“ ohne einen Grund unter dem Boden gehabt zu haben und ohne uns den Grund dafür mitgeteilt zu haben. Denn seine Arbeit baut nicht auf und schafft kein Werk, ihr Lohn ist auch kein Umsturz der Gesellschaft, sondern – sollte sie gelingen – nur das Ende der Angst. Wer in die Leere geht, in das Eis, den Kastenraum, das offene Meer, den kahlen Kubus oder in die Wüste sucht Bühnen auf, die sich wie keine anderen dazu eignen, von einem bestimmten Weltort aus die Welt und sich selbst zu minimieren. Diese Verortung, die sich selbst verneint, erschüttert das Selbstsein, die Verankerung in der Welt und die Zugehörigkeit zu den Anderen und der Gesellschaft. Indem diese abgeschiedenen Orte außer Kargheit nichts geben, schenken sie vermeintlich souveräne Existenz durch Überwindung. Tatsächlich wird nur über die Widersprüche eines handlungsarmen Körpereinsatzes und die Versicherung des Nichts eine Auslotung des Raumes möglich werden. Das heißt, der leere Raum wird durch Volumen und Wahrnehmung eingenommen, zugleich wird er sich gerade durch dieses Bemühen weiter entziehen. Wie bei jedem Entzug wird sich schließlich Nähe in Ferne, Anwesenheit in Abwesenheit und Gelingen in Zerstörung verwandeln. In einer ortsbezogenen Arbeit versetzt sich Paul Petritsch für sechs Tage in eine solche Ausnahme-situation. In Bregenz begibt er sich in den kahlen Ausstellungsraum im vierten Geschoß des Kunsthauses, um dort, von sechs Videokameras gefilmt, für sich und auf sich alleine gestellt auszuharren. Eine Kommunikation findet nicht statt. Die Eigenbeobachtung des Körpers scheint der einzige Austausch mit der Umwelt. Petritsch wird – je länger er zwischen den Gussbetonwänden aushält – die Kontrolle und sich selbst immer mehr verlieren. Er wird sich setzen, vielleicht Zum-Liegen-Kommen oder in Stellung bringen, jedoch nicht um sich zu postieren oder zu posieren, sondern weil er dem Körper nicht zu entrinnen vermag, wie dem zweckfreien Raum, dem er sich selbstverschuldet überantwortet. Gesucht und aufgesucht wird von ihm dasjenige, was allgemein tunlichst vermieden wird: Zustände des Antwort- und Ausweglosen, der Verletzlichkeit und des Dazwischenseins. Denn nur wenn der Raum diesem hartnäckigen Sinnsucher in dieser unbegreiflichen Form begegnet, als Vakuum, Leere und in einer Weise, in der ihm Gleichgewicht und gewöhnliche Erlebniszusammenhänge abhanden kommen, kann er zum Spiegel und Austragungsort des Selbst werden. In Großprojektionen haben die BesucherInnen die Möglichkeit, Zustand und Veränderung im Grauen in Echtzeit nachzuvollziehen. Das mürbe-machende Geschehen, bei dem nichts geschieht, ist aber zum Zeitpunkt seiner Wiedergabe schon vorbei. Der Protagonist ist während der Ausstellung bereits erlöst, die Dokumentation ist eine Rückschau, das zu Sehende in die Vergangenheit abgerückt. Und dennoch belegen diese Bilder die Bedrängnis des Selbstversuchs, das Schweigen, Beharren, Aushalten und die ängstigende Aura. Der Raum, dem sich der Künstler ausliefert, ist nun aber durch die Wiedergabe auf den Leinwänden verdoppelt. Die aufgestellten Kameras sind entfernt. An deren Stelle finden sich lebensgroße Membrane, die die BetrachterInnen in eine räumliche Konfusion versetzen. Als Übung der Furchtbekämpfung und zugleich Versuch, sich auf ein Befinden der Furcht einzulassen, ist diese Arbeit zu verstehen, als mönchische Methode, sich auf ein Tun einzulassen, dass nichts anderes tut, als zu unterlassen. Doch der prekäre Zustand des Verlorenseins wird für Dritte nur bedingt, aus der Medienschau und eben nicht am eigenen Leibe, nachzuvollziehen sein. Denn die entwürdigenden Bedingungen, in die sich der wagnisreiche Protagonist begab, bieten lediglich einen bildhaft gespeicherten Hinweis auf die Geworfenheit, Grundlosigkeit und die Unergründlichkeit des Daseins, denen sich Petritsch tatsächlich vergewisserte und denen das Ich – genau genommen – nie zu entrinnen vermag. […] For Kunsthaus Bregenz—as an icon of contemporary architecture an ideal case of stylisation and alienation—Nicole Six and Paul Petritsch develop a work in which it is a matter of experiencing architecture in a one-to-one situation. For the viewer this is made comprehensible via media with real-time consistency. The basic idea is not to exhibit something at the Kunsthaus but to confront the building, which is seen as a functioning organism, with something which is also physical and in the last resort in fact one‘s own body. Paul Petritsch takes six days time and experiences the third upper floor of the Kunsthaus in its pure form, empty of art, between two exhibitions. 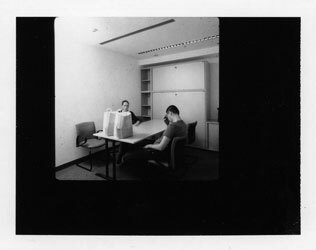 Six cameras positioned in the room record the situation from various angles in which Paul Petritsch is occupied with himself. There are blind spots and overlaps so the artist is sometimes not filmed at all or else duplicated. 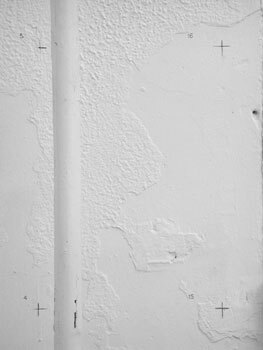 While Paul Petritsch, as the protagonist, spends his time in the exhibition room, which he only leaves to eat, shower or visit the WC, Nicole Six follows the six-day course of the project almost at the other end of the camera via monitor in the basement of the Kunsthaus. For the exhibition visitors the cameras are replaced by projectors directed at projection surfaces (the representation media). Thereby the situation recorded is repeated in belated, simulated real-time. 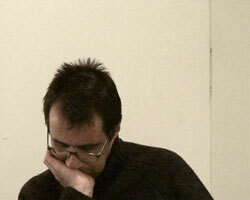 Like Petritsch himself, the viewers must make a decision about where they stand and how long they stay in the room. Sometimes there is something to be seen on the projections, sometimes there is not. In architecture such as that of KUB which denies a view to the outside, its interior life (art or person) automatically takes centre stage. 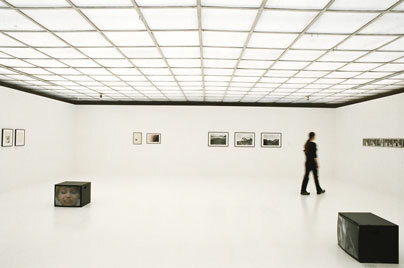 Visitors are made aware of this through the filmic and exemplary playback of the room in which they are located. Viewers see and experience themselves in a mirror. 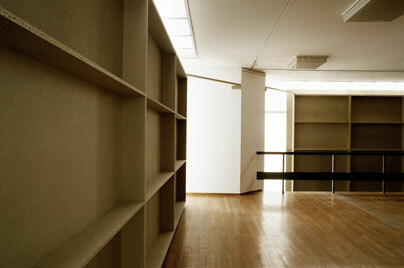 The project is comparable with the works Raum and Longitude/Latitude by Six/Petritsch. 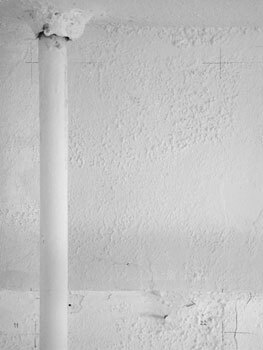 In the video Raum, where the physical law of gravity was suspended, the experience of space and movement is tightened in time and the spatial perception linked to the body is intensified. 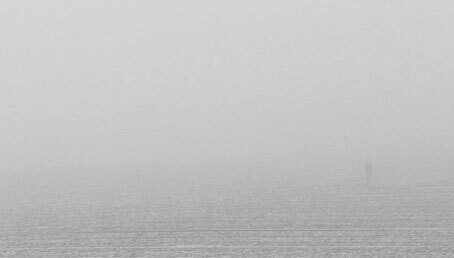 On the ship there were moments of pause and of elongated movement through which the two artists were at sea for six days. 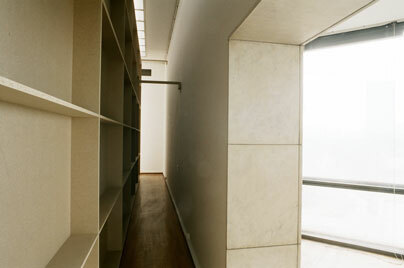 It is surprising that Paul Petritsch compares his experience of the sea and distance with the KUB room of only 450m2. Contrary to his fear of an experience of constriction, the exhibition room opened up for the artist: “You have nothing to do and you look into an incredible distance.” Here the perception that viewers bring with them takes effect. Depending on the individual assessment, they see the window-less room as a cell or a refuge and the time spent there as horror or luxury. The work leads back to one‘s own perspective in exemplary fashion as renarration, by revealing the conscious breathing in of architecture as lunacy or a “coming to oneself”. This approach is certainly minimalist. 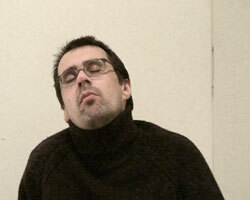 But it is existential at the same time because being thrown back to one‘s own physicality evokes questions of meaning. 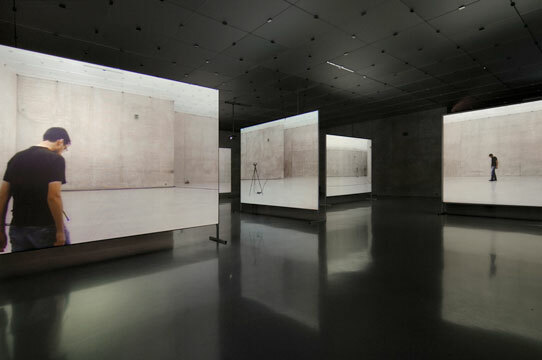 The arrangement and simple setting of the screens in the exhibition room follows the original film set which was designed according to the objective criteria of an overview. The 216 DVDs on which proceedings were filmed are the archival side of the work. Through these storage media and the set of cameras and projections the project becomes possible to follow and reproduce. The medium in itself does not provide any fruitful survey data, it is not an end in itself. The sparking point lies in the overlapping of the presence and the movement of the artist with that of the exhibition visitor. 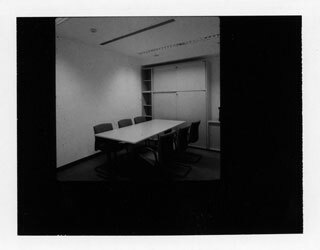 Through the people in the room it becomes a vague spatial situation in which presence and absence balance each other. 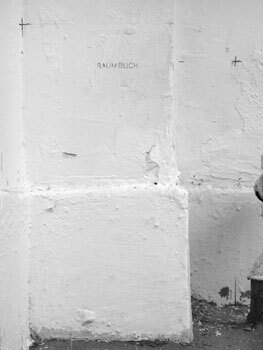 Through the experience awoken in the cone of light which orients itself to reality to scale, reality becomes a stage on which a one-man show duplicates the experience of architecture: Petritsch is neither a prop, a piece of furniture nor an artwork, he is present. The film is neither a remake nor simulated experience but simply a recording of what happened. But like Nicole Six, who followed the recording via a monitor, due to the medium the viewer remains separated from the original experience. Here is shown the sad existence of representation which can only show a pretence of being human. On the screens—the resonators of our imagination—the body becomes alienated and recedes. 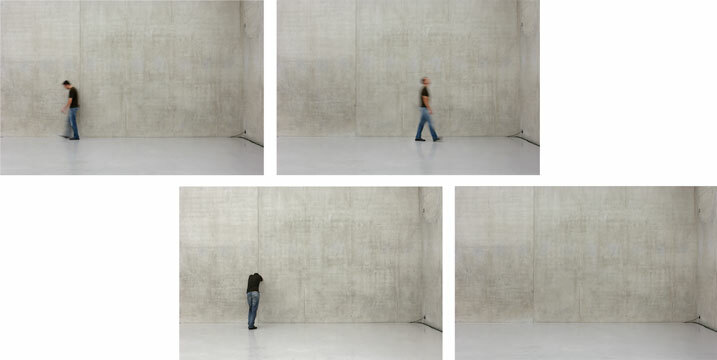 While the white cube ultimately also leaves aside the viewer as a threat and architecture theory avoids human presence (that is, emotionality) like the plague, the work by Six/Petritsch provides an alternative model for surveying space. The basis of this is real experience, independent of whether this is subsequently connected to media or imagined. Its simple urgency, its life circumstances reach the viewer. And on the other hand you simply take six days‘ time at a stretch. […] Für das Kunsthaus Bregenz – als Ikone zeitgenössischer Architektur ein Idealfall der Stilisierung und Entfremdung – entwickeln Nicole Six und Paul Petritsch ein Werk, in dem es um das Erleben von Architektur in einer eins zu eins Situation geht. Für den Betrachter wird dies mit Echtzeitkonsequenz medial nachvollziehbar gemacht. Grundüberlegung ist, im Kunsthaus nicht etwas auszustellen, sondern dem als funktionierenden Organismus gesehenen Gebäude etwas ebenfalls Körperliches und in letzter Konsequenz tatsächlich den eigenen Körper gegenüberzustellen. Paul Petritsch nimmt sich sechs Tage lang Zeit und erlebt das dritte Obergeschoss des Kunsthauses in seiner puren, kunstentleerten Form zwischen zwei Ausstellungen. Sechs im Raum positionierte Kameras nehmen die Situation, in der Paul Petritsch mit sich selbst beschäftigt ist, aus verschiedenen Blickwinkeln auf. Dabei gibt es tote Winkel und Überschneidungen, die den Künstler manchmal gar nicht oder zweimal aufnehmen. Während Paul Petritsch als Protagonist im Ausstellungsraum verweilt und diesen lediglich zur Nahrungsaufnahme, Dusche oder zum WC-Besuch verlässt, verfolgt Nicole Six den sechstägigen Projektverlauf quasi am anderen Ende der Kamera via Monitor im Keller des Kunsthauses. Für den Ausstellungsbesucher werden die Kameras durch Projektoren ersetzt, die ihr Bild auf Projektionsflächen (die Medien der Repräsentation) werfen. Damit wird die aufgezeichnete Situation in nachträglicher, simulierter Echtzeit wiederholt. Wie Petritsch selbst, trifft nun der Betrachter die Entscheidung über den Standpunkt und die Verweildauer im Raum. Manchmal ist auf den Durchlichtprojektionen etwas zu sehen, manchmal nicht. In einer Architektur, die wie beim KUB den Blick nach außen verweigert, wird ihr Innenleben (Kunst oder Mensch) automatisch zum Zentrum. Die filmische und modellhafte Wiedergabe des Raumes, in dem man sich befindet, bringt dies zu Bewusstsein. Der Betrachter sieht und erlebt sich im Spiegel. Vergleichbar ist das Projekt mit den Arbeiten Raum und Longitude/Latitude von Six/Petritsch. Im Video Raum, wo sich die Gesetzmäßigkeit der Erdanziehung aufhob, war die Erfahrung von Raum und Bewegung zeitlich gestrafft und die mit dem Körper verknüpfte Raumwahrnehmung intensiviert. Auf dem Schiff gab es die Momente des Verharrens und der gestreckten Bewegung, durch die die beiden Künstler sechs Tage auf dem Meer unterwegs waren. Erstaunlich ist, dass Paul Petritsch die Erfahrung des Meeres vom Erlebnis der Weite mit dem lediglich 450m2 großen KUB-Raum vergleicht. Entgegen der Befürchtung einer Erfahrung von Enge, öffnete sich für den Künstler der Ausstellungsraum: „Man hat nichts zu tun und schaut in eine unglaubliche Weite.“ Hier greift die Perspektive, die der Betrachter mitbringt. Je nach individueller Einschätzung begreift er den fensterlosen Raum als Zelle oder Refugium, und die darin verbrachte Zeit als Horror oder Luxus. Als Nacherzählung führt das Werk modellhaft zurück zum eigenen Blickwinkel, in dem sich das bewusste Einatmen von Architektur als Wahnsinn oder als ein „zu sich selbst kommen“ offenbart. Sicherlich ist dieser Ansatz minimalistisch. Doch er ist zugleich existentiell, da das Zurückgeworfensein auf die eigene Körperlichkeit Sinnfragen evoziert. Die Anordnung und schlichte Inszenierung der Leinwände im Ausstellungsraum folgt dem ursprünglichen Filmset, der nach den objektiven Kriterien des Überblicks angelegt war. Die 216 DVDs, auf denen das Geschehen aufgenommen wurde, sind die archivarische Seite des Werks. Durch diese Speichermedien und das Set von Kameras und Projektionen wird das Projekt nachvollziehbar und reproduzierbar. Das Medium an sich liefert keine ergiebigen Vermessungsdaten, es ist kein Selbstzweck. Der zündende Funke liegt in der Überschneidung der Präsenz und der Bewegung des Künstlers mit der der Ausstellungsbesucher. Durch den Menschen im Raum wird es eine vage Raumsituation, in der sich An- und Abwesenheit die Waage halten. Durch das im Lichtkegel wachgerufene Erleben, das sich maßstäblich an der Wirklichkeit orientiert, wird die Realität zur Bühne, auf der ein Ein-Mann-Stück das Erleben von Architektur doppelt: Petritsch ist weder Requisite, Möbelstück noch Kunstwerk, er ist anwesend. Der Film ist weder Remake noch simuliertes Erleben, sondern schlicht die Aufzeichnung des Geschehens. Doch ähnlich wie für Nicole Six, die via Monitor die Aufnahme verfolgt, bleibt der Betrachter vom ursprünglichen Erleben medial getrennt. Hier zeigt sich die traurige Existenz der Repräsentation, die menschliches Sein nur vorgaukeln kann. Auf den Screens – den Resonanzkörpern unserer Vorstellung – entfremdet und schwindet der Körper. Während der White Cube als Denkmodell letztlich auch den Betrachter als Gefährdung ausklammert und die Architekturtheorie menschliche Präsenz (sprich Emotionalität) wie die Pest meidet, bietet die Arbeit von Six/Petritsch ein Alternativmodell von Raumerfassung. Die Basis dafür ist die tatsächliche Erfahrung, unabhängig davon ob diese in weiterer Folge medial gekoppelt oder imaginiert ist. Ihre schlichte Dringlichkeit, ihr Lebensumstand erreicht den Betrachter. Und andererseits nimmst du dir einfach sechs Tage am Stück Zeit. >It is a fascinating mathematical paradox that the volume of a real object is limited, but the calculation of its surface may tend toward infinity—the smaller the scale, the more bulges and gaps fold up and the larger the surface becomes. 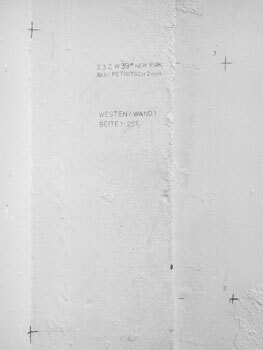 Six and Petritsch undertook to trace this phenomenon when measuring the studio they were given to use on a half-year scholarship in New York City. Instead of the usual square meters, they chose the standard DIN-A4 sheet as a basic unit of square measure for the room which—as it turned out—was comprised of 2,478 such units. 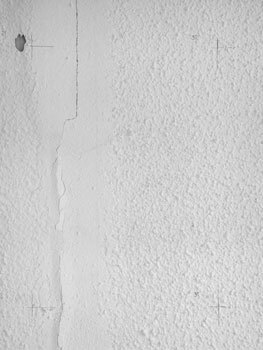 Photographed piece by piece and represented in original scale, they add up to a book of as many pages: an object in which space implodes. 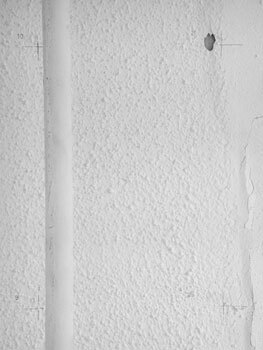 Six and Petritsch respond to the challenges of the new city by taking their own bearings: using a simple structural survey of their immediate environment and transforming space into a book, they create a tension-loaded relationship between the encountered physical struc­ture and its detached representation, bet-ween the encompassing above-and-beside and the linear one-after-the-other, between the whole and the detail. 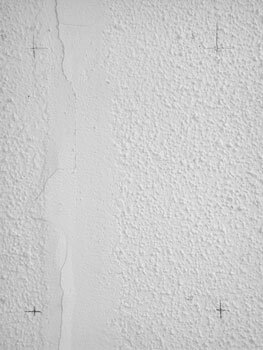 White walls page after page. 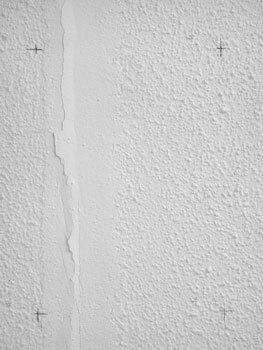 In the repetition of the apparently ever same, space starts disintegrating. This abstraction process, the dissociation of the physical poses a challenge to a keen eye. 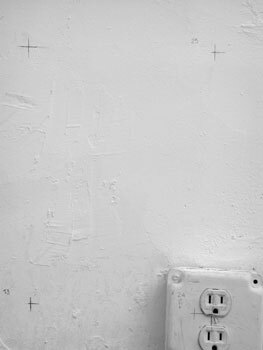 They gaze fixates on the smallest uneven spots and irregularities in the plaster, and in the vast expanse of the wall surface sockets, ledges, water pipes and mains become points of attraction. 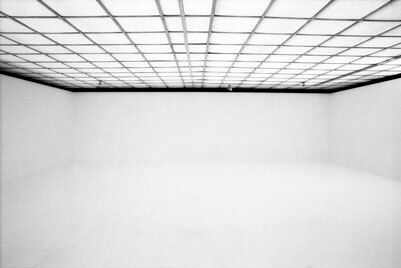 At these points, the studio designed as a White Cube in anticipation of presentations yet-to-come of art yet-to-be- produced loses its neutral ambience—space turns into this space. In recording the given setup, Six and Petritsch also inscribe space with the DIN A4 grid and the logic of the book. The DIN-A4 page, a paper industry standard, is the usual copy shop duplication size and hence defines their feasible possibilities of producing an artists’ book. From these given circumstances, they develop a pattern for their minimal, but systematic intervention into space. 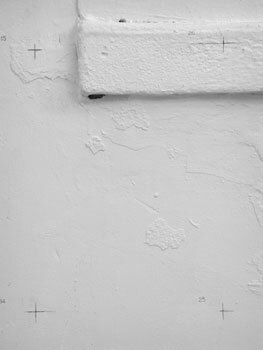 The drawings on the walls, the floor and the ceiling are simple typographic marks: register quoins and page numbers. The register quoins play a special role. Normally, they define the size, the body of a book. While their usual purpose it to merge in the trim line and to survive in this from only, as a line in space, their significance multiplies in the interweaving of the contexts of book and studio space. For they make the new system of coordinates visible. 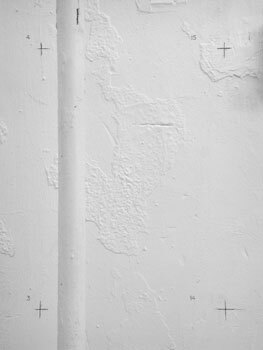 Taken for itself, each little quoin marks a separate place, indicating “here” and the “presence of the one who drew them”. 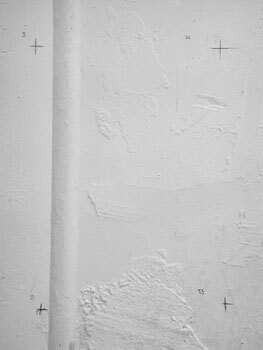 With similar consistency, the numbering of the individual fields on the walls does not follow the usual reading direction, but starts from the right bottom, in front of the feet. 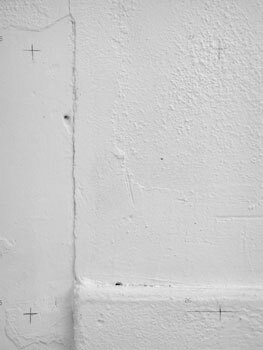 The artists’ hereness, their physical and mental presence in the studio space becomes discernible in small inaccuracies. Despite representation at a one-to-one scale, the surfaces are not really congruous. The reason for this is not so much the laborious and tiresome process of the meticulous measuring of the room and the resultant mistakes, but lies in the realization itself. 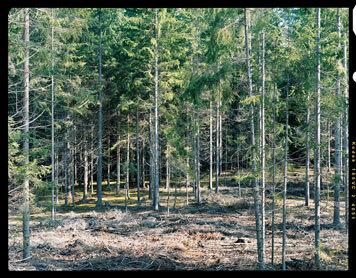 Aside from overlaps and doublings, there are camera-induced shifts in the grid. 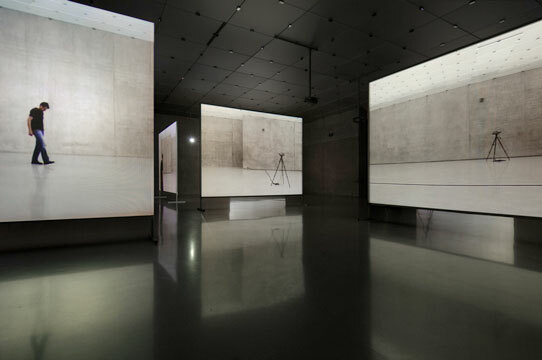 The central perspective of the camera focus makes projections in the wall appear distorted and moved farther insidethe frame. This can be seen, for example, in the register quoins which sometimes do not disappear on the trim line but seem to leap in to the picture from the margins of the book, thus embodying most clearly the difference between concept and implementation, the gaps in the system. >Es ist ein faszinierendes mathematisches Paradoxon, dass das Volumen eines realen Objektes begrenzt ist, sich die Berechnung seiner Oberfläche jedoch im Unendlichen verlieren kann – je kleiner der Maßstab, desto mehr Ausbuchtungen und Spalten in der Materie entfalten sich und umso größer wird die Oberfläche. Nicole Six und Paul Petritsch sind diesem Phänomen auf der Spur, wenn sie das Atelier, das ihnen als Stipendiaten in New York für ein halbes Jahr zur Verfügung stand, vermessen. Statt der gewohnten Quadratmeter wählen sie die DinA4-Seite als grundlegendes Maß für den Raum, der – so das konkrete Ergebnis – 2478 solcher Einheiten umfasst. 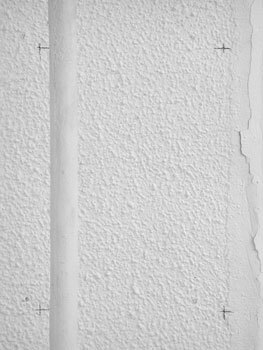 Stück für Stück fotografiert und im Verhältnis 1:1 abgebildet wird daraus ein Buch mit ebenso vielen Seiten: ein Objekt in dem der Raum implodiert. Six/Petritsch antworten auf die Herausforderungen der neuen Stadt mit einer Standortbestimmung. Mit einer einfachen Bauaufnahme ihrer unmittelbaren Umgebung und in der Transformation des Raumes zum Buch erzeugen sie ein wechselseitiges Spannungsverhältnis zwischen dem körperlichen Gegenüber und der distanzierteren Abbildung, dem umfassenden Über- und Nebeneinander und dem linearen Nacheinander, dem Ganzen und dem Detail. Seite um Seite weiße Wand. In der Wiederholung des scheinbar immer Gleichen beginnt der Raum sich zu zersetzen. Dieser Abstraktionsprozess, die Auflösung des Gegenständlichen fordert den detektivischen Blick heraus. 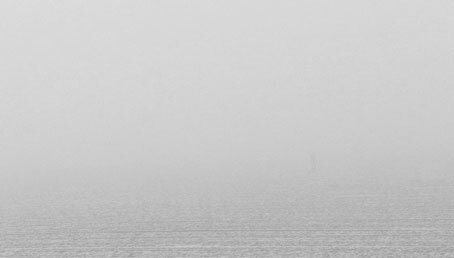 Das Auge sucht sich seine Ankerpunkte in den minimalen Unebenheiten und Unregelmäßigkeiten im Putz. 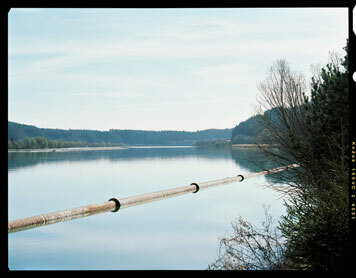 In der Weite der Fläche werden Steckdosen, Mauervorsprünge, Wasserrohre und Leitungen zum Ereignis. 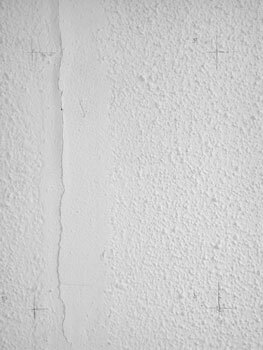 Das Atelier, im Vorgriff auf spätere Präsentationen der Kunst, die hier erst entstehen soll, als White Cube gestaltet, verliert an diesen Punkten seine Neutralität – aus dem Raum wird dieser Raum. Mit der Aufzeichnung des Vorhandenen schreiben Six und Petritsch dem Raum zugleich das Raster der Din A4-Seite und die Logik des Buches ein. Die DinA4-Seite, eine Standardisierung der Papierindustrie, ist das gängige Vervielfältigungsmaß des Copy­shops und entspricht somit den realen Produktionsmöglichkeiten der beiden für ein Künstler­buch. Aus ihren Gegebenheiten entwickeln sie das Muster für ihren minimalen aber systematischen Eingriff in den Raum. 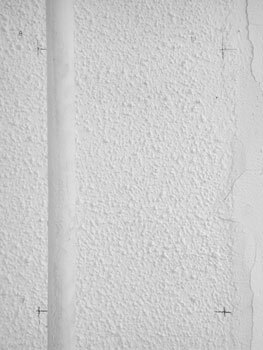 Die Zeichnung an den Wänden, am Fußboden und an der Decke besteht aus einfachen typografischen Setzungen: Passmarken und Seitenzahlen. Den Passmarken kommt dabei eine besondere Rolle zu. Für gewöhnlich bestimmen sie das Format, den Körper eines Buches. Während es ihre eigentliche Bestimmung ist, als grafisches Hilfsmittel im Schnitt aufzugehen und einzig in dieser Form, als Linie im Raum, weiterzuleben, erfahren sie in der Verschränkung der Kontexte Buch und Atelierraum eine Vervielfachung ihrer Bedeutung. Sie sind es, die das neue Koordinatensystem sichtbar machen. Jedes einzelne kleine Kreuz markiert für sich genommen einen Ort, bedeutet „hier“ und „Anwesenheit des/der Zeichnenden“. Mit ähnlicher Konsequenz folgt die Nummerierung der einzelnen Felder auf der Wand nicht der gewohnten Leserichtung, sondern beginnt unten rechts, vor den Füßen. Ein Buch ist ein Raum ist ein Buch. Six und Petritsch setzen wiederholt zusammen, was sie zuvor zerlegt haben. Doch trotz der Abbildungen im Maßstab 1:1 entsteht keine tatsächliche Kongruenz der Flächen. Die Ursachen dafür sind weniger in der langwierigen, ermüdenden Umsetzung der akribischen Raumvermessung und den daraus resultierenden Fehlern zu suchen, sie liegen vielmehr in der Realisierung selbst. Zu den Überschneidungen und Verdoppelungen an den Rändern, kommen kameratechnisch bedingte Verschiebungen im Raster. Aufgrund des zentralperspektivisch ausgerichteten Fokus der Kamera erscheinen Vorsprünge in der Wand verzerrt und innerhalb der Rechteckstruktur weiter innen. Am deutlichsten zeigt sich dies erneut an den Passmarken. Manchmal nämlich verschwinden sie nicht im Schnitt, sondern springen an den Rändern des Buchs ins Bild und markieren so die poetische Differenz zwischen dem Konzept der Gleichsetzung und der im Widerstand des Materials begründeten Unmöglichkeit einer Deckungsgleichheit. Ein Buch ist kein Raum ist kein Buch.